The cold, grey, wet had done its work. And F's ankle. And the fact that we had to drive an hour to the north, west, or south to find something different from the pervasive agricultural milieu of the corn/wheat belt of Brittany. Enough crêpes and cows and corn! We packed quickly, explained our decision to our kind hosts (who'd gone out of their way to make our stay interesting, in spite of the unusually bad weather), forfeited our rental, and headed SOUTH. To clinch our decision we had a really bad creperie lunch in Pontivy before heading sort of towards Bordeaux. It was a Sunday. Nothing was open. We had no maps for any of France below Poitiers. Hmmm. We followed signs and managed to go only about 50 miles out of our way to finally get onto A10 and take a direction vaguely southwest. Eventually we found a rest-stop, got a map (and phone card), and realized somewhere just below the Loire river that we were seeing red tile roofs, ochre plaster facades and light-colored stone houses, and Muscadet vineyards. La belle France! Suddenly it was 10 degrees warmer. Towns perched on hills. We'd made a good decision. 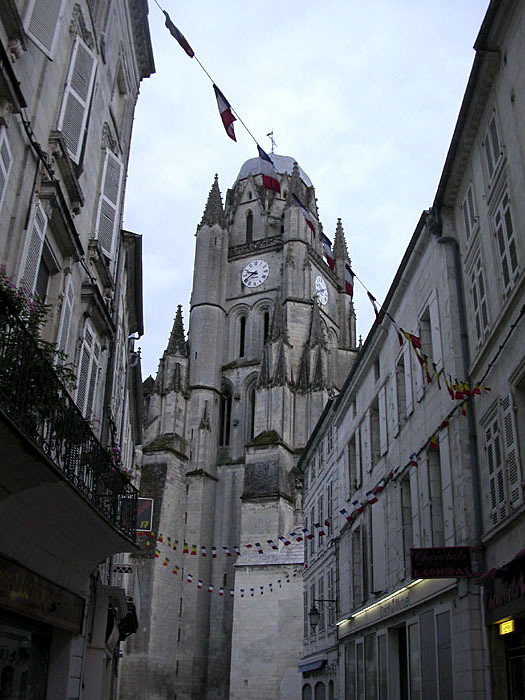 We landed towards evening in the sweet little city of Saintes in the Cognac region. You could read a newspaper at 10:30 outdoors. The old quarter of the town had been pedestrianized, and we wandered among Roman ruins and restaurants till we found a really GOOD little restaurant chock full of clients for a fine Sunday evening late dinner. I had gésier salad, steak, grilled tomatoes, haricots verts, apple tart, and a very good wine for less than $16. We slept in a "Fasthotel" business hotel in a commercial zone of some sort. Never mind. We were on the road again.